I recently had the honour of being published on the Thesis Whisperer blog. Most people in society can get through their entire lives being blissfully unaware of the Thesis Whisperer blog, but for Australian PhD candidates the Thesis Whisperer is a way of life. Part mental health advice column, part PhD survival skills, part PhD community building, Thesis Whisperer helps make the PhD possible. ANU's Inger Mewburn is the creator of Thesis Whisperer and works in the wonderful world of research research - researching the academy and PhD experience. I approached her with a few blog ideas a year ago and she very kindly published one of my posts. It had a pretty excellent viewer rating of over 3,500 views, not including the 35,000 strong mailing list the posts are sent to weekly. You can see my blog post here. After spending my whole PhD trying to get some media interest it is at the very end that I have had some success - this week I had the very enjoyable experience of appearing on the Beyond Zero Emissions podcast with Anthony Daniele and Matt Grantham. During our chat we talked about my research relating to the potential for network operators to 'push back' on increasing penetrations of small-scale solar, covered in my article for RenewEconomy; the potential 'brain drain' of renewable energy experts from energy utilities; and how to try to influence government policy. I think I made things a little difficult for the interviewers - definitely speaking for more than 2-3 minutes per question! - but would love to do more interviews in the future. I have now worked my way through academic publisher Elsevier's fairly painful audioslide application to create a short annotated slideshow of the key themes of my recently published Energy Policy article "Network operators and the transition to decentralised electricity: An Australian socio-technical case study". It's always been a goal of mine to try to get some media interest in my research. I've now unsuccessfully tried publishing in The Conversation three times, however today I've had great success with publishing a post in RenewEconomy. RenewEconomy is the number one source for renewable energy news in Australia, and it turns out there are quite a lot of industry people reading it - as I know from the friends and colleagues who have been in touch today to let me know they enjoyed my post! 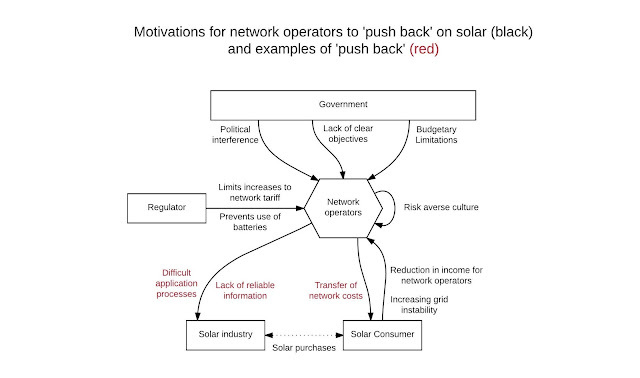 The article talks about my latest research article, which looked at network operators and why they might 'push back' on additional distributed generation, like solar energy. One of the best aspects of publishing is seeing how people respond to the article, with people in the energy community agreeing to the research findings and wondering how we should overcome political influence restricting renewable energy adoption in the energy industry.